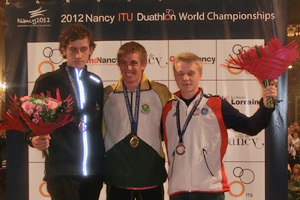 Rotherham Harrier, Elliot Smales travelled to Nancy in France to compete in the Duathlon 2012 World age group championship on 23rd September, which coincided with his eighteenth birthday. He had qualified for the event by winning his age group (17 - 19 years old) back in the 10th?March 2012 at the Dambuster duathlon at Rutland water. The U19 event was made up of a 4 x 2.5km lap run (10 km), 5 x 8 km lap bike (40 km) and a 2 x 2.5km lap run (5 km). Elliot?s age group consisted of athletes who had travelled from as far away as New Zealand and South Africa to compete making it a stiff test for all competitors. On the first part of the race Elliot settled in quickly to his running and worked hard in the second half of the 10 km to post a time of 36:22 which put him in 3rd?place in his age group. A speedy transition meant Elliot was quick on to the wheel of the 2ndplace athlete and his biking strength helped him move up in to 2nd?position and cut the deficit to the age group leader from 2:50 to 14 seconds. His bike split time of 1:01:58 proving to be by far quickest time in his age group. Elliot ran hard on the 5 km run but his efforts on the bike had taken a toll and he slipped back from 2nd?to 3rd?chasing hard to the line to record a total time of 2:00:01 less than 52 seconds behind the winner and 25 seconds behind second place. Elliot was extremely pleased to medal in this prestigious event and will be working hard on his running through the winter down at Rotherham Harriers AC as well as honing his swimming and biking skills ready for the next triathlon season.